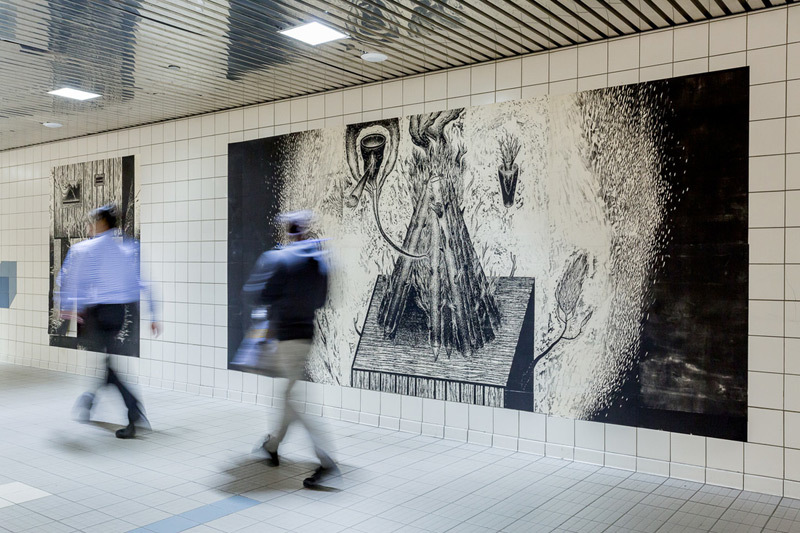 Two weeks ago, the Green Tease network gathered at the Edinburgh Printmakers for a discussion of their most recent exhibition Firedamp: Revisiting the Flood by Canadian artist Sean Caulfield. Joined by Sean remotely over Skype, and Emily Brady, Professor of Environment and Philosophy, University of Edinburgh, we entered into a discussion provoked by the exhibition around themes of changing relationships to energy production and consumption, and the means by which artistic practices can open up new spaces for dialogue around the complex issues of environmental sustainability and climate change. Following the event, we’re very pleased to publish Emily Brady’s response to the Firedamp exhibition as delivered on the evening. As I see it, the Firedamp exhibition potentially creates a ‘culture/SHIFT’ ‘making the invisible visible, revealing hidden and underlying structures which impact upon environmental sustainability of current and future societies’ (www.creativecarbonscotland.com/project/cultureshift/). The term ‘firedamp’ refers to an explosive gas emitted in coalmines and oil gas fields. In the 1800s, it was referred to as ‘bags of foulness’. ‘Foulness’ is a rich term. It describes things that are unpleasant, and bags of foulness suggest lots of it, dissipated, with the potential to foul the air completely. Foulness refers to bad things, but perhaps not to things that are awful to the core, terrible, or horrific. Foulness is a sensory experience; to find something foul is mostly through touch, smell and taste. Of course, we can find things foul just by looking at them – say, when disgusted by a carcass (but even here, other sensory modes may be engaged, even if by imagination). 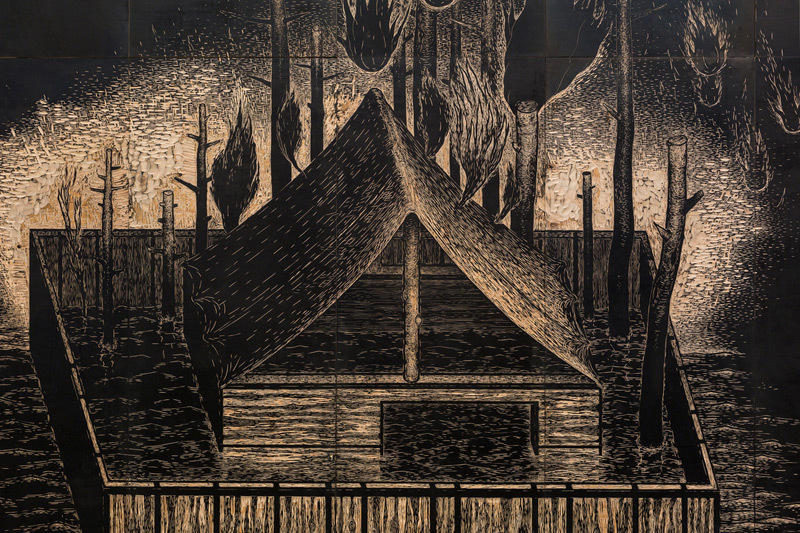 The themes of Sean Caulfield’s Firedamp that come to mind for me are: oil – black, rich, thick oil (floods too, but are these floods of water, or floods of oil oozing with a foul texture; viscous)? Looking at it and imagining getting stuck in it, drowning in it, clawing one’s way out of it before being crudely swallowed up. There is also water. Is the Japanese-looking house floating in a great pool, the flood from Fukushima, from the huge wall of water that is the tsunami? Or is the fragile structure of the Firedamp piece, floating, even at risk of sinking, into a pool of thick black oil? These themes crisscross two places on the earth, each with a different story. The first: Ōkuma, Fukushima, Japan. Prior to the disaster, the Fukushima nuclear power plant would be, for some, a symbol of the greatness of human technology – the ability to split large atoms to produce vast amounts of energy. For others, it was a natural and human disaster that was waiting to happen; the plant situated vulnerably, at a single point in time, in the path of an earthquake and a great wall of water. The second place is on the other side of the Pacific Ocean in Canada, the tar sands of northeastern Alberta. The technology and devastation of tar extraction and conversion to crude oil affects vast places. We know that oil is foul, creating a world dependent on this energy source and its production, with the unpleasant – no – dire consequences being anthropogenic climate change. Fukushima is a natural and multispecies disaster which killed thousands. As a disaster, Fukushima had both human and natural causes at its center. Tar sands and the production of oil in places like Alberta is controversial: oil production secures jobs and economic progress, while at the same time destroying environments, other creatures and species, and contributing along the causal chain to climate change. In turn, this process threatens the livelihoods of humans in parts of the world spatially distant from the sources of the greatest consumption of oil – largely the Global North, remembering again that it is not just people who are affected by climate change, but also the more-than-human world. Crude oil is also a natural and human technological co-production; the sources of oil lie in the tar sands just under the skin of the earth. This is a disaster happening now, and only set to get much worse. Sean’s work conveys to me themes of this human-natural engagement, co-production, co-creation, human-natural entanglements, crimes committed together – intended or unintended – with consequences for human and beyond. 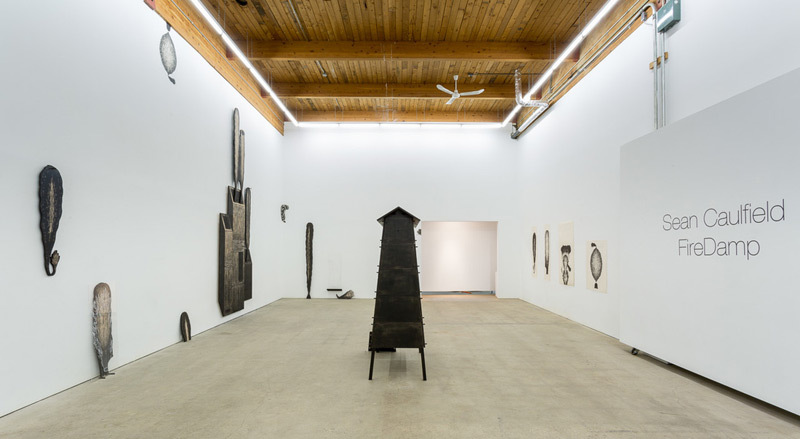 The organic forms in these artworks move between human technology and leaf forms, leaf shapes, dead, defoliated trees, odd stump-like branches; growth coming out of the ground pushing through the surface of the earth. Some of the forms seem organic, of the natural world, but morphing into or somehow like human-made technology (the snake-like fire hose of Souffleur). Are they becoming artifacts? Perhaps you’re thinking: humans are natural too; what’s the difference? Sure, humans are biological creatures. We humans grow; we need sustenance, food, water, to flourish, like plants. Like other mammals, humans reproduce and give birth to offspring; we play; we age; we die. And humans are not the only species, one might say, that possess technology. Crows and other corvids use tools; beavers make lodges and dams; many birds and insects create incredible, complex nests. But to say that humans possess technology is to say that they intentionally, through choice, through a clear kind of agency, create particular kinds of infrastructure on a grand scale to extract resources from the earth or to manipulate physical phenomena such as the atom. It is through these kinds of choices – which involve the ability to decide whether these forms of energy production are good or bad – that give you or me the capacity to judge that technology, to judge those actions, and to say within the culture of the human species, or within a particular human community, that such things may be right or wrong. In judging the tar sands or the Fukushima disaster, do we blame nature for what has happened? No. It would be odd, would it not, to blame hydrocarbons and the bitumen from the sand for climate change? It is the uses of oil that are blamed – the stinking emissions of cars and human practices that have created dependence on oil across the globe. We consider a tsunami a natural occurrence caused by another, that is, an earthquake deep in the earth’s crust (even if there may be some human cause in some dissipated kind of way, as we find with human effects on weather). But that is not enough for us to say that the tsunami is caused by humans. Similarly, consider the new geological age of the Anthropocene, in which stratigraphers have determined that humans have now affected the earth in a pervasive way. I would argue that this does not mean that the human imprint on the earth runs through all the things that we have previously considered to be natural. To be sure there is no such thing as pristine wilderness. We know that a Spam tin has been found in the Mariana trench, that deepest part of the world’s oceans, at 10 or 11,000 metres deep. Humans have affected the earth, the atmosphere, and space, certainly, but these effects are stronger and weaker. There remain natural organisms and processes which are autonomous, operating independently of human intentionality and technology, and continuing to be most extraordinary. So, I would say that we can continue to embrace both continuity between human and more than human natures, as well as difference. That is what I find fascinating about Firedamp. The works consider human-nature entanglements and raise questions about those entanglements (especially the foul), and worse, the consequences of them. 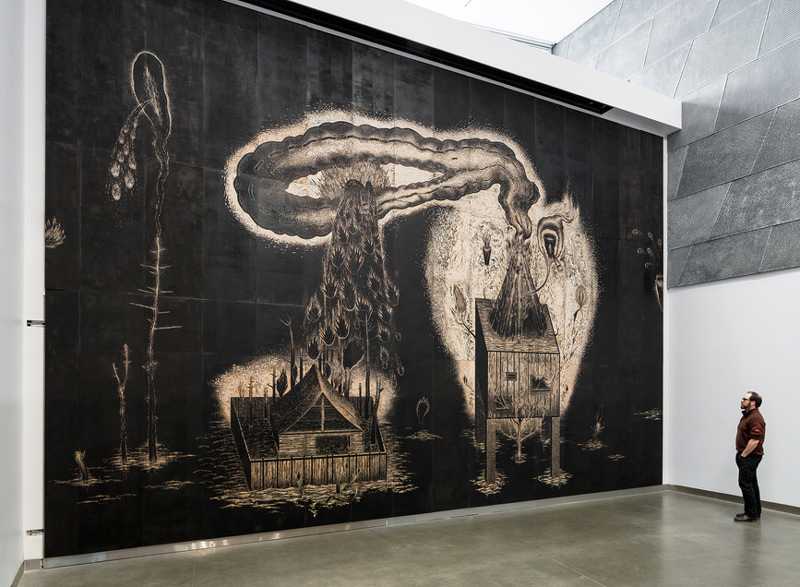 These woodcuts are not, however, apocalyptic. Not really, for me. They are not deeply negative renderings of apocalyptic landscapes or futures. There are traces, to be sure, of the landscapes of nuclear disasters throughout history. I’m not sure that I see hope in Sean’s work, something that I hold dearly in these really difficult political and moral times. Perhaps the boat carrying the tree stump in Cargoship is hopeful, carrying the tree stump to safety? I don’t know. But I do see the uncanny, the strange, the foul, the tragic, the death of the natural world and the precarity of human life and structures, like the home. These artworks remind me of Paul Nash’s landscapes of war, with trees stripped of life, of leaves, branches, greenery, fullness – but also of artist Edward Gorey’s whimsical, strange, uncanny characters, the pen-and-ink drawings themselves behaving like little woodcuts. The black-and-white of Sean’s woodcuts certainly contribute to a light sense of doom. There is also fire flaming out, the glow of fire, and forms reminiscent of bellows, among the many biological–organic–earthy things which populate the artworks. I do not see the promise of life revitalizing itself – which is where hope might lie – except perhaps that these stumps and branch fragments have at least a few leaves on them. If there is hope, maybe we can find it through imagination; through imagining not that we can escape or overcome the flood of water and oil or the darkness of natural-human disasters, but in recognizing the entwining of humans with the rest of the natural world, and learning better ways of coexistence. Thank you to everyone for joining us at this event. Green Tease is an ongoing informal events programme which connects creative practices and environmental sustainability. Since 2013 Green Tease has offered a platform for those interested building links between the arts and sustainability through the exchange of ideas, knowledge and practices. Interested in finding out more about Green Tease? Or running your own Green Tease event?